Unless you are calling your own business, or a caller points it out, you need to know that you're digital message equipment is doing its job and getting your on hold messages across. All our onhold systems and on hold players are bullet proof in their design and run day in, day out, in 1000's of businesses World Wide. The MOH1200 Digital On Hold System is by far the market leader in high quality telephone digital message equipment and player delivery with features that keep it user friendly and most importantly running faultlessly. Messages on hold can be loaded by USB connection directly into the digital message equipments on board memory (like an external hard drive) or simply selected to play from an MMC/SD card making updating a simple plug and play operation. The OS8000 Digital On Hold System is designed for easy operation of the occasional updating of the on hold messages. On hold player updates to on hold messages can simply be emailed and loaded onto the removable thumb drive (USB Stick) and plugged directly into the front of the on hold system for automatic playing. The OS2700 Digital On Hold System is the ultimate in fast updating of on hold messages. When your business requires its on hold messages to be updated, our production studio connects to your sites digital message equipment for immediate updating via your existing fax line or spare extension. If your business is continually changing promotions or activities then this digital on hold equipment is the unit to keep you at the cutting edge of technology. Keep your telephone image consistent by incorporating a Digital Answering Machine with the same style audio production and voice over artists as your telephone on hold messages. 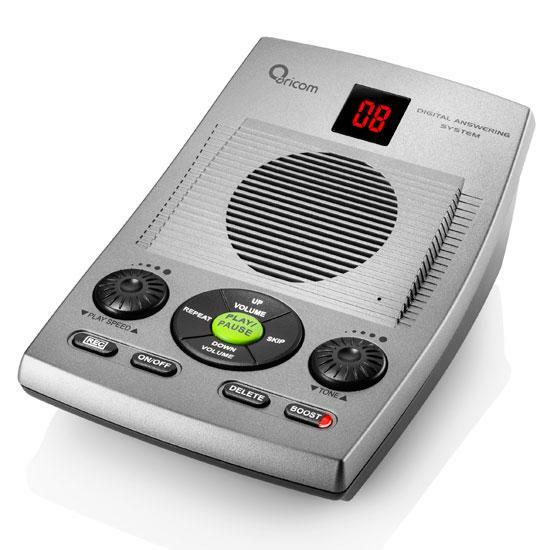 The Oricom system has a 50 minute recording capacity and ample space for a professional after hours courtesy message to be loaded. Extra loud speaker and solid state memory means your message will always be heard!